A Happy Song: Our "New" Table! I'm so excited today! We received an amazing gift from my parents yesterday. A "new" table! I put new in quotes because this is the table that I grew up sitting at, but it is new to our house and it fits perfectly. We've been using a dinette set that the previous owner of our home didn't want to pack. 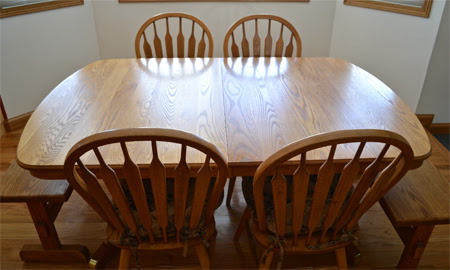 While I liked the way the dinette set looked in the space, it just wasn't very practical for a growing family. The chairs weren't terribly comfortable and the seats were upholstered so they could not be removed for cleaning (very nice with toddlers). The real problem was that it just wasn't big enough. 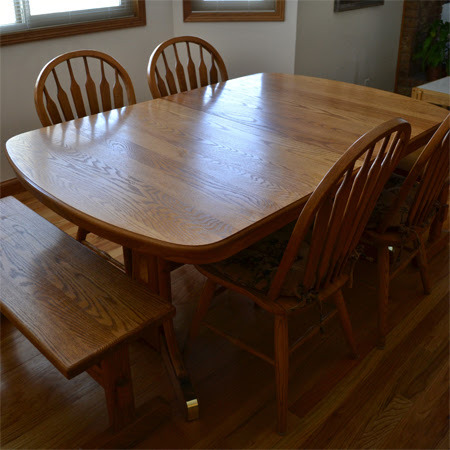 It could only seat four and made it practically impossible to serve meals family style at the table. We have not been able to invite dinner guests or even host lunch after a playdates without having to figure out extra seating. Hooray for a new table that can seat up to ten if I wish! How awesome is that? The kids have been having a whole lot of fun picking their new spots at the table and now there is plenty of room for baby brother when he's ready to be seated in a highchair. I would have never believed that someday I'd be old enough that a dining set would absolutely make my day. Funny how being a mom can change things.